While most of the progammes in ITV do not require a paid subscription, you will still need to register an account with them in order to stream content. Fortunately , the registration is pretty straight forward and best of all, free. First of all, please ensure our Simpletelly DNS service is set up and working correctly on your computer. 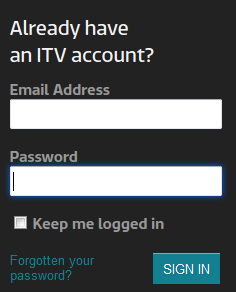 Note: ITV Player has recently re-branded itself to ITV HUB, however the steps to register below are still the same albeit with a slightly different interface. Click on the Register or Sign In button found at the top right corner of your screen. Enter the required details ensure that the Terms & Condition box is checked. You should now receive an email from ITV confirming the registration. Follow the steps detailed in the email to activate your account. 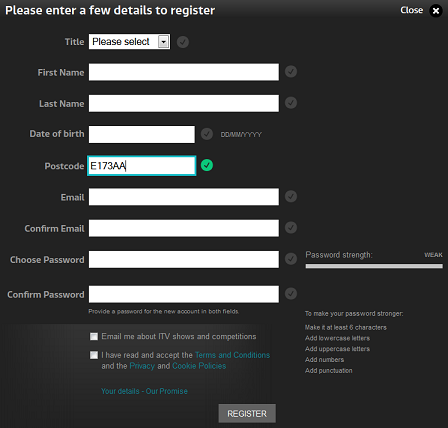 Once the registration is successful, return to ITV Player website or ITV App and Sign In using your new details.